While home prices and construction levels are on the rise, the most recent estimates suggest that the rate of household growth slowed during the first half of 2013 from what had been promising indications of a rising trend through 2012 (Figure 1). The rise in household growth last year had been a key source of optimism that the housing recovery was being built on the solid ground of expanding demand for additional housing. The latest indication of a possible slowdown in household growth raises a cautionary flag that we have not fully turned a corner on the slowdown in household formation that began during the Great Recession. 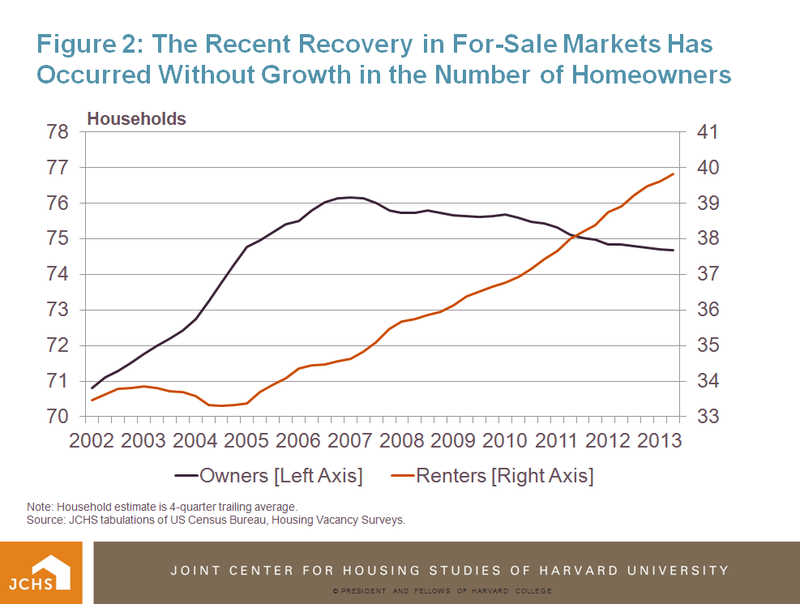 It also raises questions about how long a recovery in the single-family for-sale market can be sustained absent greater growth in homeowner households. Note: Annualized growth is change in trailing 4-quarter average household estimate from previous year; year-over-year growth is change in quarterly household estimate from previous year. Source: JCHS tabulations of US Census Bureau, Housing Vacancy Surveys. The source of the recent estimates is the quarterly Housing Vacancy Survey (HVS) conducted by the Census Bureau, which in addition to providing data on vacancies and homeownership rates also provides the timeliest available estimates of the number of owner and renter households. The HVS quarterly estimates are somewhat volatile, but this volatility can be dampened by examining averages of the previous four quarters, which is how the annual HVS estimates are produced. There are also non-trivial differences in the count of households from this survey compared to the decennial census for reasons that are not well understood. Over the course of the past decade household growth estimates from the HVS were on the order of 15 percent below what the decennial censuses indicated, suggesting there is a downward bias in household growth from this survey. But while there are questions about the accuracy of the overall count of households from the HVS over time, there is still reason to believe that the survey is useful as an indicator of the latest trends in the direction of household growth. The HVS data for the second quarter (Q2) of 2013 suggest that not only was the acceleration of household growth reported for 2012 less than originally reported, but also that growth has slowed in the first half of 2013. Back in 2012, HVS data were showing that annual household growth in the US had rebounded significantly, to a level of 980,000 for the year after averaging less than 600,000 over the previous five years. With the Q2 2013 data release, however, the HVS also revised its 2012 annual household growth estimate down by over 100,000 households to a less robust level of 857,000. 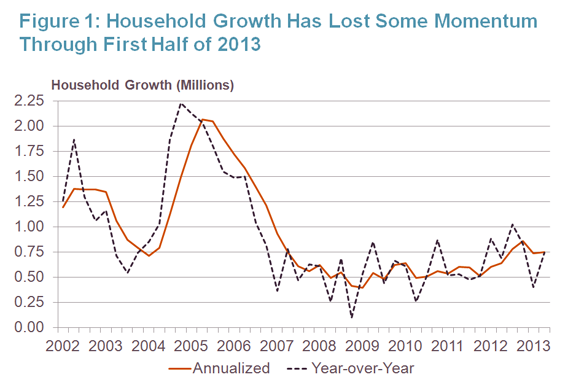 On top of the downward revisions to 2012 growth, HVS data now also show that in the first quarter of 2013, the year-over-year pace of household growth plummeted back to the lowest rate since mid-2010, down to 403,000. While the Q1 number could have been a statistical blip, the Q2 number shows household growth still just 746,000 - well below last year’s annual pace. 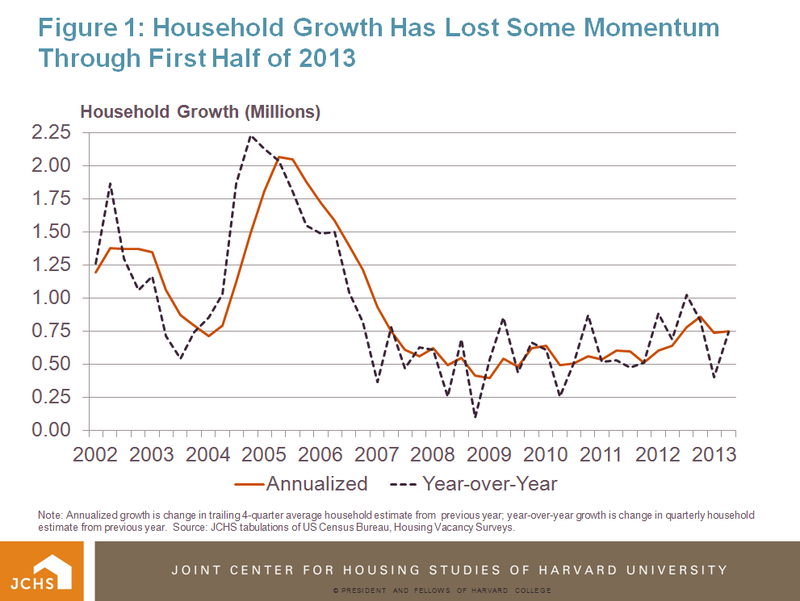 Taking these two quarters into account, the most recent annualized household growth rate is just 751,000. Given this pace household growth will have to average nearly 1.2 million in the second half of the year just to match last year’s reported growth. 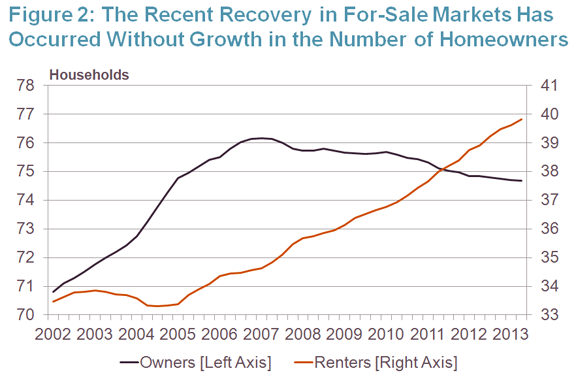 The Q2 HVS data also show that the homeownership rate failed to reverse its downward course in the second quarter of 2013. While the Q2 rate of 65.0 percent is unchanged from Q1, it is still 0.5 percentage point below the homeownership rate from a year ago. Of particular concern is that behind the homeownership rate decline is a contraction in the number of homeowners (Figure 2). Based on a 4-quarter moving average estimate of households, the number of homeowners was down by 178,000 in the second quarter of 2013. This contraction is on top of newly released revisions to historical HVS data that show fewer homeowners in 2012 than originally reported. In all, the number of homeowners in HVS is 1.5 million below its peak at the start of 2007. Note: Household estimate is 4-quarter trailing average. Source: JCHS tabulations of US Census Bureau, Housing Vacancy Surveys. These trends suggest that recent gains in home prices and single family home construction have been driven more by a restricted supply of homes for sale amid demand from existing owners rather than by growth in first-time homebuyers adding to the number of owners. With continued weakness in household growth and declines in the outright number of homeowners, the latest HVS data suggest that for-sale housing markets may face challenges to a sustained recovery if the inventory of homes for sale expands but the number of households looking for homes does not.